Ever have a polish that sits in the back corner alone, silently nagging (or crying out for attention) while you ignore it in favor of new pretties? In my collection this is it. I don’t have a real recollection of how I acquired it, but I suspect that it may have appeared in a random swap a few years ago. When it first came into my possession, I hadn’t really developed a taste for glitter polishes yet (I got to indies through the holo route and had to be dragged into other things kicking and screaming. (But I love having all the options now. My bank account not so much.) So this poor polish just languished in the back of my Helmer, unloved. Until now. I finally moved this from the shadowy depths of the Helmer to my active “basket” of things to swatch in November. 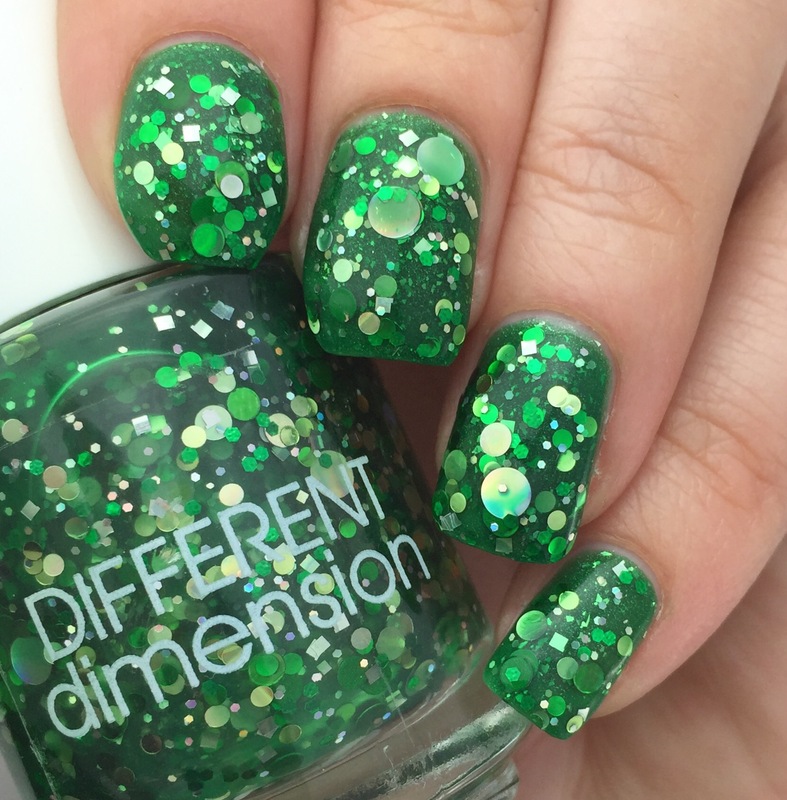 I like Different Dimension, I love green,, and I’m warming to glitter, so why not, right? So I slapped it right on and realized something that should have occurred to me much earlier: Different Dimension “This Is Not Fir”” is a jelly. Like honest-to-goodness sheer jelly. Four and a half coats into this glittery endeavor, I realized that this simply was not going to build to opacity. Nope, not happening, despite my best efforts to lay on layers thicker than Cretaceous sediments. So I did what any sane blogger would do and took some pictures to show you. Just kidding. Actually, I got irrationally mad that the polish wasn’t doing what I wanted and acetoned that sh*t right off. Take that, ha! Who’s in control here? Me! 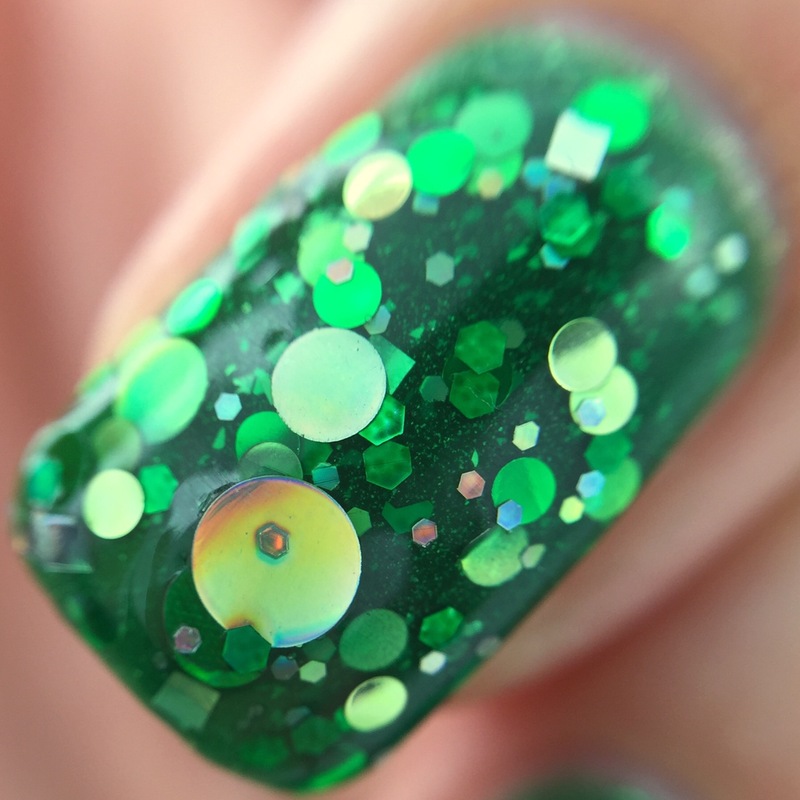 Then I started right over with a base layer of Ever After “Hocus Pocus,” a nice kelly green holo with flakes (which you can clearly see in this picture because the glitter topper is the sheerest). Now, to be fair to “This Is Not Fir,” I really like the glitter combination. The silvers and greens work well in the green-tinted jelly base to give it a very dimensional look. Plus I’m really starting to love circle glitters, which this polish has in three different sizes. All the joy of chunky glitter, without the angular pokey bits to catch on things. to be even more fair, I probably shouldn’t hate this polish for being what it is- a sheer jelly. But I’m fickle, and polishes need to learn the hard lessons of life somehow. 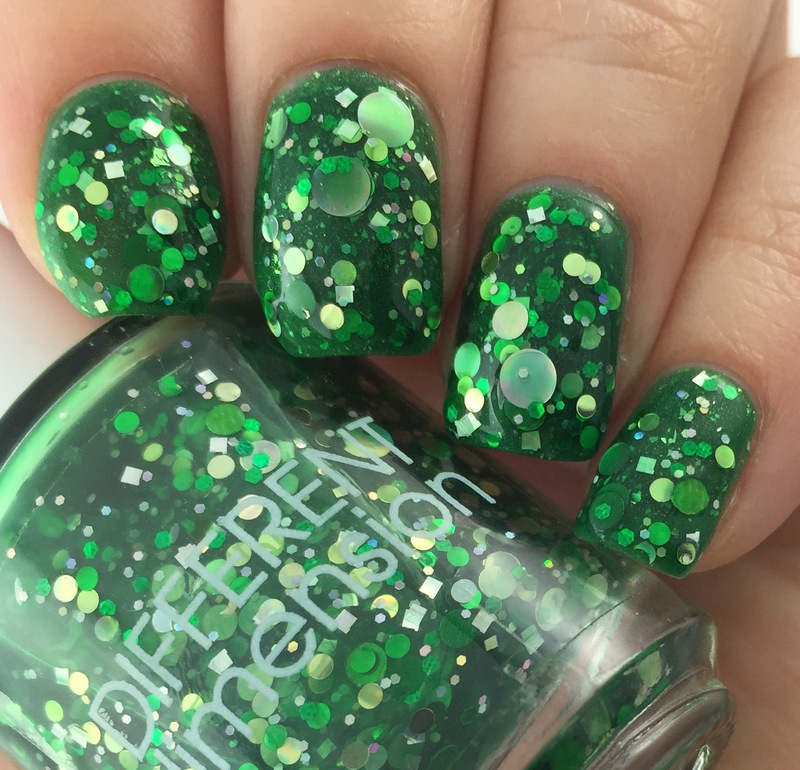 However, if you are a lover of green desperately in need of a coordinating glitter topper that really let you show off the green polish underneath- hey, I know just the perfect polish for you! Those chunky glitters look so neat! I don’t typically like to use glitter, but every so often I get in the mood. Thanks for the heads up on how sheer it is! This is so St. Patrick’s Day. You’ve got to pull it out again in March. You’ll have the prettiest nails around. Ahhhh!!!! I didn’t even think of that! Hah thank you for your honesty! I hate jellies because they are jellies but it’s true that they do look great with a base color coat. 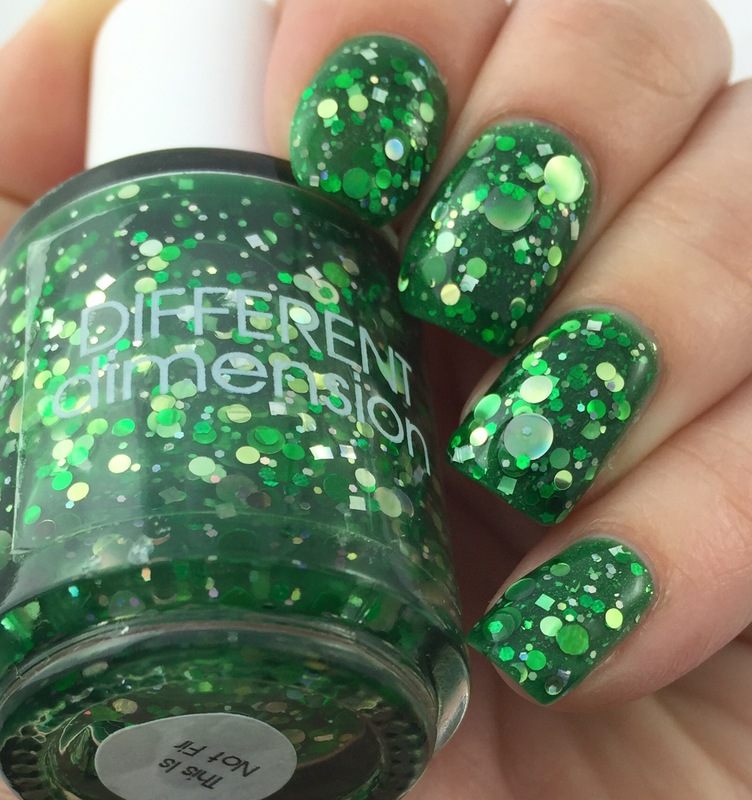 My favorite Different Dimension polish is Orion Nebula, and this is kind of like a green Christmassy version of that, so I really like it. I hear you on the jelly being too clear though, sometimes you just need some undies. Great swatch! I have only recently found Different Dimension….LOVE! Wow look at that glitter!! Your swatches are amazing! This color is simply stunning. I am not usually a glitter person, but I am OBSESSED!